ଉତ୍ତର ସାଂଜିର ଏହି ଉପଗ୍ରହ ଚିତ୍ରରେ ବିଶାଳ ପ୍ରାଚୀରର କିଛି ଅଂଶ ଦେଖି ହେବ । ବର୍ଗଚିତ୍ରର କର୍ଣ୍ଣ ଦିଗରେ ଦକ୍ଷିଣ-ପଶ୍ଚିମ ପଟରୁ ଏକ ବିଖଣ୍ଡିତ ବକ୍ରରେଖା ପରି ଉତ୍ତର-ପୂର୍ବ ଦିଗକୁ ଯାଇଥିବା ବସ୍ତୁ ହେଲା ବିଶାଳ ପ୍ରାଚୀର । ତେବେ ଉତ୍ତର-ପଶ୍ଚିମରୁ ଦକ୍ଷିଣ-ପୂର୍ବକୁ ଯାଇଥିବା ଓ ସ୍ପଷ୍ଟଭାବେ ଦେଖାଯାଉଥିବା ଅଂଶଟି ଏକ ନଦୀର ଚିତ୍ର । ଉତ୍ତୋଳନ କରାଯାଇଥିବା ଭୂଖଣ୍ଡର ପରିସୀମା ହେଲା ୧୨ × ୧୨ ବର୍ଗ କି.ମି. ମହାକାଶଚାରୀ ୱିଲିୟମ୍ ପୋଗ୍‍ୟଙ୍କ ମନରେ ଭ୍ରମ ସୃଷ୍ଟି ହୋଇଥିଲା ଯେ ସେ ସ୍କାଇଲାବ୍‍ରୁ ବିଶାଳ ପ୍ରାଚୀର ଦେଖିଥିଲେ କିନ୍ତୁ ପ୍ରକୃତରେ ତାହା ବେଜିଂଗ୍ ନିକଟସ୍ଥ ଗ୍ରାଣ୍ଡ କେନାଲ୍ ଥିଲା । ସେ ଦୂରବିକ୍ଷଣ ସହାୟତାରେ ବିଶାଳ ପ୍ରାଚୀର ଦେଖିଥିଲେ ଓ ଆହୁରି ମଧ୍ୟ କହିଥିଲେ ଯେ ଖାଲି ଆଖିରେ ବିଶାଳ ପ୍ରାଚୀର ଦେଖାଯାଉନଥିଲା । ୧୯୮୦ ଦଶନ୍ଧିରେ ଯୁକ୍ତରାଷ୍ଟ୍ର ଆମେରିକାର ଜଣେ ସିନେଟର୍ ଜେକ୍ ଗାର୍ଣ୍ଣ୍ ଏକ ମହାକାଶଯାନରୁ ବିଶାଳ ପ୍ରାଚୀର ଦେଖିଥିବାର ଦାବୀ ରଖିଥିଲେ ଯାହାକୁ ଅନେକ ମହାକାଶଚାରୀ ପ୍ରତ୍ୟାଖ୍ୟାନ କରିଥିଲେ । ଯୁକ୍ତରାଷ୍ଟ୍ରର ଜଣେ ପୁରୁଖା ମହାକାଶଚାରୀ ଜିନ୍ ସେର୍ନାନ୍ କହିଥିଲେ ଯେ ୧୦୦ରୁ ୨୦୦ ମାଇଲ୍ ଉପର ଉପଗ୍ରହ କକ୍ଷରୁ ବିଶାଳ ପ୍ରାଚୀର ସତରେ ଖାଲି ଆଖିରେ ଦେଖିହେବ । ଅନ୍ତର୍ଜାତୀୟ ମହାକାଶ କେନ୍ଦ୍ରର ଏକ୍ସପିଡିସନ୍-୭ର ବୈଜ୍ଞାନିକ ଏଡ୍ ଲୁ ଏହି ବିଷୟରେ କହିଥିଲେ ଯେ "ପୃଥିବୀର ଅନ୍ୟ ବହୁ ବସ୍ତୁଙ୍କ ସହିତ ତୁଳନା କଲେ ବିଶାଳ ପ୍ରାଚୀର ଅପେକ୍ଷାକୃତ ଅସ୍ପଷ୍ଟ ଭାବେ ଦିଶେ ଓ ବିଶାଳ ପ୍ରାଚୀର ଦେଖିବା ପାଇଁ ଦେଖଣାହାରୀକୁ ଠିକ୍ ସ୍ଥାନରେ ଖୋଜିବାକୁ ହେବ ।"
୨୦୦୧ ମସିହାରେ ନିଲ୍ ଆର୍ମଷ୍ଟ୍ରଙ୍ଗ୍ ଆପୋଲୋ-୧୧ରୁ ତାଙ୍କୁ ଦେଖାଯାଇଥିବା ଦୃଶ୍ୟ ସମ୍ପର୍କରେ କହିଥିଲେ ଯେ " ମୋର ବିଶ୍ୱାସ ଯେ ମୁଁ କୌଣସି ମନୁଷ୍ୟକୃତ ବସ୍ତୁ ବା ଅଟ୍ଟାଳିକା ଦେଖିପାରିନଥିଲି । ଆଜି ପର୍ଯ୍ୟନ୍ତ ମୁଁ ଏପରି କୌଣସି ବ୍ୟକ୍ତି ସହିତ କଥା ହୋଇନାହିଁ ଯେ କହିପାରିବ କି ସେ ଉପଗ୍ରହ କକ୍ଷରୁ ଚୀନର ବିଶାଳ ପ୍ରାଚୀର ଦେଖିଛି ।....ଚୀନ ଉପରେ ସ୍ପଷ୍ଟ ଦିବାଲୋକ ସମୟରେ ଉଡ଼ିଥିବା ଅନେକ ମହାକାଶଚାରୀଙ୍କୁ ମୁଁ ଏ କଥା ପଚାରିଛି ; କିନ୍ତୁ ମୁଁ କଥା ହୋଇଥିବା ଲୋକଙ୍କ ମଧ୍ୟରେ କେହି କହିନାହାନ୍ତି ଯେ ସେମାନେ ବିଶାଳ ପ୍ରାଚୀର ଦେଖିଛନ୍ତି ।"
ପଶ୍ଚିମ ସୀମାର ଜ୍ୟାୟୁଗ୍ୱାନ୍ ଗିରିପଥରେ ଥିବା "The First Mound"
↑ "China's Great Wall Found To Measure More Than 20,000 Kilometers". Bloomberg. June 5, 2012. Retrieved June 6, 2012. ↑ The New York Times with introduction by Sam Tanenhaus (2011). The New York Times Guide to Essential Knowledge: A Desk Reference for the Curious Mind. St. Martin's Press of Macmillan Publishers. p. 1131. ISBN 978-0-312-64302-7. 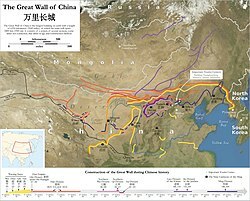 Beginning as separate sections of fortification around the 7th century B.C.E and unified during the Qin Dynasty in the 3rd century B.C.E, this wall, built of earth and rubble with a facing of brick or stone, runs from east to west across China for over 4,000 miles. ↑ "Great Wall of China". Encyclopædia Britannica. Large parts of the fortification system date from the 7th through the 4th century BC. 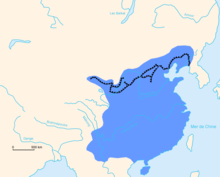 In the 3rd century BC Shihuangdi (Qin Shi Huang), the first emperor of a united China (under the Qin dynasty), connected a number of existing defensive walls into a single system. Traditionally, the eastern terminus of the wall was considered to be Shanhai Pass (Shanhaiguan) in eastern Hebei province along the coast of the Bo Hai (Gulf of Chihli), and the wall's length—without its branches and other secondary sections—was thought to extend for some ୬,୬୯୦ କି.ମି. (୪,୧୬୦ mi). ↑ ୪.୦ ୪.୧ "Great Wall of China 'even longer'". BBC. April 20, 2009. Retrieved April 20, 2009. ↑ "Great Wall of China". History. April 20, 2009. ↑ Waldron 1983, p. 650. ↑ Waldron 1990, p. 202. Tan Daoji's exact quote: "So you would destroy your Great Wall of Ten Thousand Li!" (乃復壞汝萬里之長城) Note the use of the particle 之 zhi that differentiates the quote from the modern name. ↑ Byron R. Winborn (1994). Wen Bon: a Naval Air Intelligence Officer behind Japanese lines in China. University of North Texas Press. p. 63. ISBN 978-0-929398-77-8. ↑ "The Weights and Measures Act (1929)". The Legislative Yuan of the Republic of China. Archived from the original on 2014-04-25. ↑ ୧୧.୦ ୧୧.୧ Lindesay, William (2007). The Great Wall Revisited: From the Jade Gate to Old Dragon's Head. Beijing: Wuzhou Publishing. p. 21. ISBN 7-5085-1032-1. ↑ ୧୨.୦ ୧୨.୧ Lovell 2006, p. 15. ↑ Waldron 1990, p. 49. ↑ Waldron 1983, p. 651. ↑ Waldron 1990, p. 21. ↑ Waldron 1988, p. 69. ↑ ୧୭.୦ ୧୭.୧ ୧୭.୨ Hessler 2007, p. 59. ↑ 歷代王朝修長城 (in ଚାଇନିଜ୍‌). Chiculture.net. Retrieved October 24, 2010. ↑ 古代长城 – 战争与和平的纽带 (in ଚାଇନିଜ୍‌). Newsmth.net. Retrieved October 24, 2010. ↑ 万里长城 (in ଚାଇନିଜ୍‌). Newsmth.net. Retrieved October 24, 2010. ↑ Slavicek, Mitchell & Matray 2005, p. 35. ↑ Evans 2006, p. 3. ↑ "Defense and Cost of The Great Wall – page 3". Paul and Bernice Noll's Window on the World. Retrieved July 26, 2011. ↑ Coonan, Clifford (February 27, 2012). "British researcher discovers piece of Great Wall 'marooned outside China'". The Irish Times. Retrieved February 28, 2012. ↑ ୨୫.୦ ୨୫.୧ Waldron 1983, p. 653. ↑ Karnow 2008, p. 192. ↑ Szabó, Dávid & Loczy 2010, p. 220. ↑ Evans 2006, p. 177. ↑ "Great Wall at Mutianyu". Great Wall of China. Archived from the original on March 9, 2013. ↑ Edmonds 1985, pp. 38–40. ↑ Lovell 2006, p. 254. ↑ Elliott 2001, pp. 1–2. ↑ "Part of the Great Wall of China". The Wesleyan Juvenile Offering: A Miscellany of Missionary Information for Young Persons. Wesleyan Missionary Society. X: 41. April 1853. Retrieved 29 February 2016. ↑ Ruysbroek, Willem van (1900) . The Journey of William of Rubruck to the Eastern Parts of the World, 1253–55, as Narrated by Himself, with Two Accounts of the Earlier Journey of John of Pian de Carpine. Translated from the Latin by William Woodville Rockhill. London: The Hakluyt Society. ↑ Haw 2006, pp. 53–54. ↑ Haw 2006, pp. 54–55. ↑ Qur'an, XVIII: "The Cave". English translations hosted at Wikisource include Maulana Muhammad Ali's, E.H. Palmer's, and the Progressive Muslims Organization's. ↑ Haw 2006, pp. 53–55. ↑ Barros, João de (1777) . Ásia de João de Barros: Dos feitos que os portugueses fizeram no descobrimento dos mares e terras do Oriente. V. Lisbon. 3a Década, pp. 186–204 (originally Vol. II, Ch. vii). ↑ ୪୦.୦ ୪୦.୧ Waldron 1990, pp. 204–05. ↑ Yule 1866, p. 579This section is the report of Góis's travel, as reported by Matteo Ricci in De Christiana expeditione apud Sinas (published 1615), annotated by Henry Yule). ↑ Waldron 1990, pp. 2–4. ↑ ୪୩.୦ ୪୩.୧ Waldron 1990, p. 206. ↑ Waldron 1990, p. 209. ↑ Waldron 1990, p. 214. ↑ Hessler 2007, p. 60. ↑ Rojas 2010, p. 140. ↑ Lindesay 2008, p. 212. ↑ "Jiaoshan Great Wall". TravelChinaGuide.com. Retrieved September 15, 2010. Jiaoshan Great Wall is located about ୩ କି.ମି. (୨ mi) from Shanhaiguan ancient city. It is named after Jiaoshan Mountain, which is the highest peak to the north of Shanhai Pass and also the first mountain the Great Wall climbs up after Shanhai Pass. Therefore Jiaoshan Mountain is noted as "The first mountain of the Great Wall". ↑ "The Great Wall: Liaoning Province". Global Times. October 14, 2014. Retrieved December 4, 2014. ↑ "Great Wall of China longer than believed as 180 missing miles found". The Guardian. 20 April 2009. Retrieved 18 April 2015. 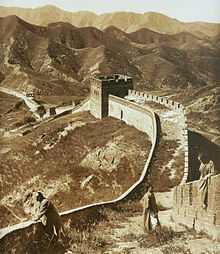 ↑ "Newly-discovered remains redraw path of Great Wall". China Daily. 15 April 2015. Retrieved 18 April 2015. ↑ ୫୩.୦ ୫୩.୧ Turnbull 2007, p. 29. ↑ Ford, Peter (November 30, 2006). 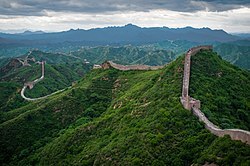 New law to keep China's Wall looking great. Christian Science Monitor, Asia Pacific section. Retrieved March 17, 2007. ↑ ୫୫.୦ ୫୫.୧ Wong, Edward (29 June 2015). "China Fears Loss of Great Wall, Brick by Brick". The New York Times. Retrieved 1 July 2015. ↑ "China's Wall becoming less and less Great". Reuters. August 29, 2007. Retrieved August 30, 2007. ↑ CNN, Ben Westcott and Serenitie Wang. "China's Great Wall covered in cement". ↑ "The Great Wall of China, Ripley's Believe It or Not, 1932. ↑ Urban Legends.com website. Accessed May 12, 2010. "Can you see the Great Wall of China from the moon or outer space? ", Answers.com. Accessed May 12, 2010. 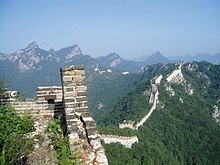 Cecil Adams, "Is the Great wall of China the only manmade object byou can see from space? ", The Straight Dope. Accessed May 12, 2010. Snopes, "Great wall from space", last updated July 21, 2007. Accessed May 12, 2010. 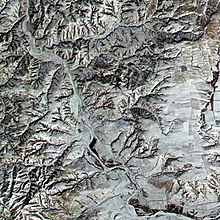 "Is China's Great Wall Visible from Space? ", Scientific American, February 21, 2008. "... the wall is only visible from low orbit under a specific set of weather and lighting conditions. And many other structures that are less spectacular from an earthly vantage point—desert roads, for example—appear more prominent from an orbital perspective." ↑ "Metro Tescos", The Times (London), April 26, 2010. Found at The Times website. Accessed May 12, 2010. ↑ ୬୪.୦ ୬୪.୧ ୬୪.୨ ୬୪.୩ López-Gil 2008, pp. 3–4. ↑ "NASA – Great Wall of China". Nasa.gov. Retrieved July 31, 2010. ↑ Dr. Stephen E. Ambrose; Dr. Douglas Brinkley (September 19, 2001). "Johnson Space Center Oral History Project Oral History Transcript – Neil Armstrong" (PDF). NASA. Retrieved July 31, 2010. Edmonds, Richard Louis (1985). Northern Frontiers of Qing China and Tokugawa Japan: A Comparative Study of Frontier Policy. University of Chicago, Department of Geography; Research Paper No. 213. ISBN 0-89065-118-3. Evans, Thammy (2006). Great Wall of China: Beijing & Northern China. Bradt Travel Guide. Bradt Travel Guides. p. 3. ISBN 1-84162-158-7. Haw, Stephen G. (2006). Marco Polo's China: a Venetian in the realm of Khubilai Khan. Volume 3 of Routledge studies in the early history of Asia. Psychology Press. ISBN 0-415-34850-1. Hessler, Peter (2007). "Letter from China: Walking the Wall". The New Yorker (May 21, 2007): 58–67. Karnow, Mooney, Paul and Catherine (2008). National Geographic Traveler: Beijing. National Geographic Books. p. 192. ISBN 1-4262-0231-8. López-Gil, Norberto (2008). "Is it Really Possible to See the Great Wall of China from Space with a Naked Eye?" (PDF). Journal of Optometry. 1 (1): 3–4. doi:10.3921/joptom.2008.3. Archived from the original (PDF) on 2008-09-10. Lovell, Julia (2006). 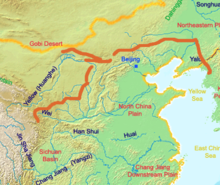 The Great Wall : China against the world 1000 BC – AD 2000. Sydney: Picador Pan Macmillan. ISBN 978-0-330-42241-3. Rojas, Carlos (2010). The Great Wall : a cultural history. Cambridge, Mass: Harvard University Press. ISBN 978-0-674-04787-7. Slavicek, Louise Chipley; Mitchell, George J.; Matray, James I. (2005). The Great Wall of China. Infobase Publishing. p. 35. ISBN 0-7910-8019-6. Turnbull, Stephen R (January 2007). The Great Wall of China 221 BC–AD 1644. Osprey Publishing. ISBN 978-1-84603-004-8. Waldron, Arthur (1983). "The Problem of The Great Wall of China". Harvard Journal of Asiatic Studies. Harvard-Yenching Institute. 43 (2): 643–63. JSTOR 2719110. Waldron, Arthur (1988). 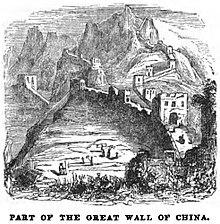 "The Great Wall Myth: Its Origins and Role in Modern China". The Yale Journal of Criticism. Johns Hopkins University Press. 2 (1): 67–104. Waldron, Arthur (1990). The Great Wall of China : from history to myth. Cambridge England New York: Cambridge University Press. ISBN 978-0-521-42707-4. Yule, Sir Henry, ed. (1866). Cathay and the way thither: being a collection of medieval notices of China. Issues 36–37 of Works issued by the Hakluyt Society. Printed for the Hakluyt society.